There are certain artists out there we all consider their word as bond, and whoever they vouch for to be equally worth listening to or should be admired as an equal to said artist. I know I am not alone in this thought, we are all guilty of this line of thinking. But, is this such a bad thing? Absolutely not, especially when it is a brilliant singer/songwriter/all around genius musician like Bradley Wik who is advertently suggesting what we should be listening to right now. 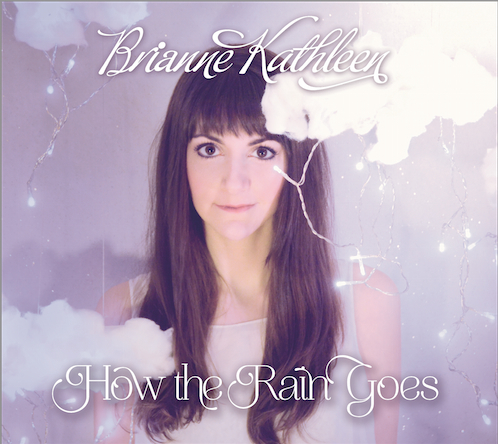 Especially when he suggest an album he played a little guitar on and co-produced entitled How the Rain Goes from the wonderful Portland based singer/songwriter Brianne Kathleen. He really hit the nail the head with this one, and I am personally grateful he was kind enough to let us know about this brilliant artist. Brianne Kathleen is an artist with an amazing set of vocal chords that stand out in the city of Roses, a city filled with amazing artists with amazing vocals. And it is almost uncanny how natural it seems to Brianne to stand out amongst her peers. She sings oh-so-sweetly, yet matter of factly enough whether she is breaking it down with a country-esque slow but steady swing on a track “Where Does Your Heart Go?”, or tossing in a bit of rockabilly meets hipster driven folk blended greatness on “So Afraid” (Note: I have not had the opportunity, but I feel like this is the track that you MUST see her perform live. I hope to do so someday). But, if it where indeed necessary to choose a stand out track from this, one of the finest albums of 2014, it has to be “Paper Bag Dreams”. Much like her friend Mr. Wik, this is a lady who obviously understands the power of metaphor and the draw of lost dreams and tortured souls. “Paper Bag Dreams” is one of those tracks you will surely find yourself listening to over and over again, simply to answer an undying question for your own mind’s sake…. Why does this seem so damn personal? There are many artist out there who are “like” Brianne Kathleen. So many comparisons can be drawn to this wonderful artist. But, she is also one of those artists that you really shouldn’t care to scapegoat in such a manner. We should simply be able to realize that Brianne Kathleen is a wonderful artist who takes very little effort to fall in love with. With powerful lyrics, a great group of friends, and voice to pine over, How The Rain Goes is an obvious gem of an album, and a brilliant sophomore effort from Brianne. And with that, brings the hope that we will soon have the chance to hear even more from this brilliant musician. How the Rain Goes is available now. Pick up a copy for yourself at her WEBSITE.